As I was tossing our unwanted packets of soy sauce into the trash (I always forget to ask them to leave them out! ), the ingredient list caught my eye. I always thought Soy Sauce was supposed to come from fermented soy beans. The closest these little packets get to that was the inclusion of hydrolyzed vegetable protein. Their HVP could come from soybeans, but there’s no way of knowing. And even it if it does, it’s a far cry from the centuries-old process of fermenting them. water, salt, hydrolyzed vegetable protein, caramel color, molasses, monosodium glutamate, citric acid, and potassium sorbate (preservative). 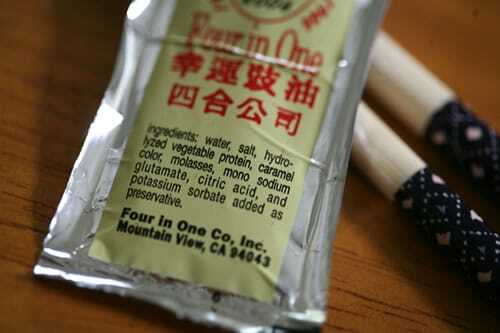 Although a little packet of this soy, I mean, salt sauce won’t kill you in the grand scheme of things, this is a good example of how it’s important to stay forever vigilant, always paying attention to what you’re putting into your body. I won’t be eating either of these during the month of October, when I’ll be giving up all processed foods. Join me! On the GF front, I don’t trust anything that is not clearly labeled (for the wife, of course, I am not gluten intolerant). When it comes to Soy Sauce, we use San-J Tamari Soy Sauce, because it says on the bottle it is gluten free. San-J also produces a number of gluten free sauces that are soy sauce based, like szechuan sauce, etc. Full disclosure, I do not work for San-J, and they have never ever given me anything for free or a reduced price. I just pimp ’em ’cause I love ’em. OK, here’s the real deal, from a former macrobiotic chef. Forget anything labeled just “soy sauce.” What you want is going to be labelled “tamari” (originally the by-product of miso-making) or “shoyu” (legally mandated to be naturally fermented soy). Eden and Oshawa are reliable brands, and San J has some good ones, too. I would seek out organic, which will eliminate the possibility of ingesting GMO soybeans. The artificial (chemically processed instead of micriobiotically fermented by aspergillus oryzae and soyae) soy sauces have been shown to contain known-cancer causing ingredients and many brands were recently banned in England. Miso and tamari, BTW, can be made at home but it takes months to years to do so. Thanks to you both for the helpful and informative comments! You can get shoyu and miso starters from GEM cultures: http://www.gemcultures.com/. There’s no time to start like now! I haven’t tried it yet. Forgot to mention the MSG is this crappy soy sauce.